I had the chance to work with some of the oldest materials we have in our predominantly 20th Century collections – these gems originate from the 1880s/1890s and belong to the Vokins archive. 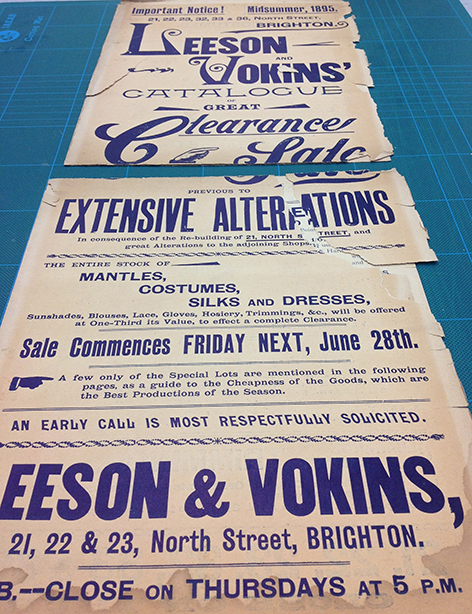 This archive has a very local focus in that for over a hundred years, Vokins was a major Brighton department store located on North Street in the centre of town. The department store closed its doors for the final time in 1997. Founded in 1882, the company was originally named ‘Leeson and Vokins’. The name changed to ‘W H Vokins Limited’ in 1937 with another shift to ‘Vokins Limited’ in 1983. The company have continued to sell furniture locally as the Vokins Furniture Centre but sadly they will be closing down early 2015 – a definite end of an era! 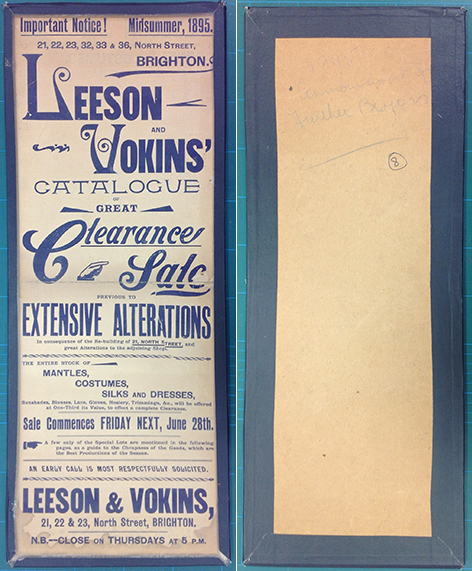 In the archive we have materials from the period when the department store was still called by its original name of ‘Leeson & Vokins’. Within the collection there were six of the older advertisements that desperately needed attention. 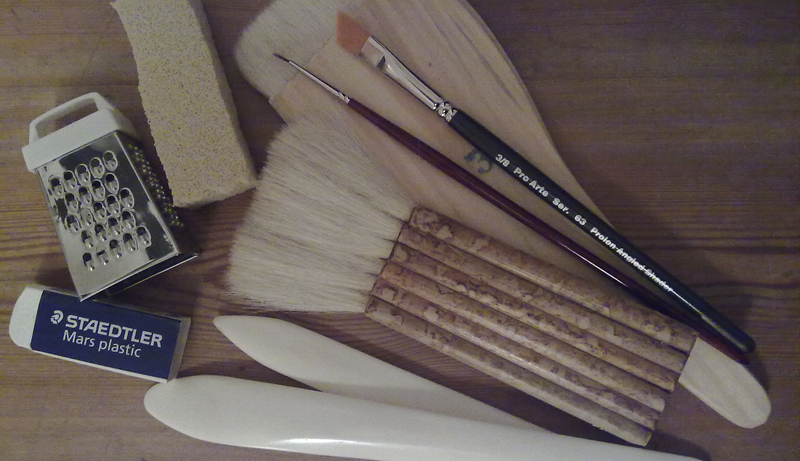 Sometime in the past, these items had all been sandwiched between an acidic, cheap backing board and a piece of glass with a tape edging holding the parcel together. My mission was to get them out for a spot of fresh air and to repair any tears and amend any holes. 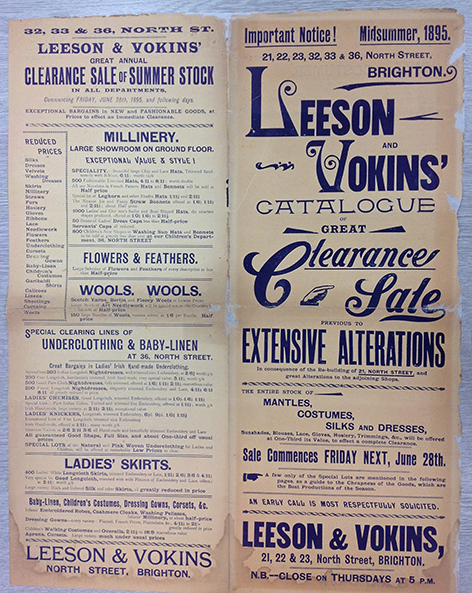 The ‘Midsummer 1895 Clearance Sale’ piece shown (see image above) was the first one I tackled. When this particular piece emerged out of its frame, I realised in just what a poor condition it was in. On this piece alone, there are tide-lines along the edges from having been previously wet, as well as discolouration to the paper on the side which was shown in the ‘frame’. On top of these issues that I can not do anything about, the paper itself is extremely brittle – tears, splits and holes were everywhere! All six pieces I worked with were folded up materials. 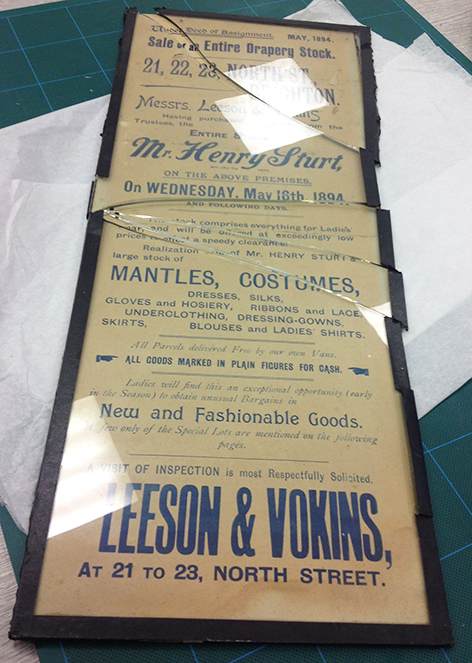 Removing their frames has revealed the adverts in their entirety after three quarters of their original contents have remaining hidden from view for many years. As you can see from the image below of the sale announcement from 1894, some of the glass of the ‘frames’ had already broken prior to my taking them on. There were no concerns about the glass being of historic importance and they were carefully disposed of for recycling. I have written before about the pleasant discoveries you can make from not only what can be considered the verso’s of items, but from their original backing boards too. 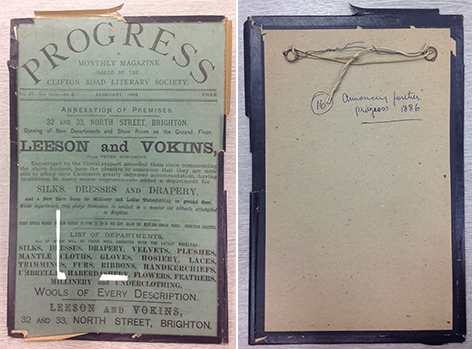 When unraveling the ‘Progress’ monthly magazine piece from 1886 away from its frame (see images below), the backing board used was a piece originating from packing materials for Crysella soap flakes. I would imagine this piece of board was used as the quickest and cheapest backing for framing the items – it must have originated from a delivery to the store from the Co-operative Wholesale Society. 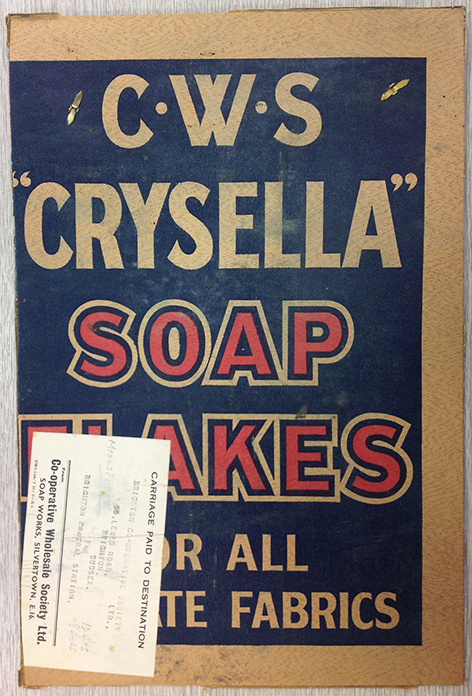 I would love to know when the Vokins advertisements were originally put in their ‘frames’ – so if anyone out there has a deep knowledge of the C.W.S Archive, it would be amazing to hear which decade this particular piece of backing board might hail from! Due to a migration of this blog to a new layout, all comments made to posts have been lost in the process. Below are the comments, with name, date and time, made for this post. It would appear that the writing on the back of the boards is my grandfathers, Gerald Vokins. I have family pictures which are framed with similar black tape dating from 1930s. Great work restoring these. Do you have hi res jpgs that I can put on our website – bigbrandbeds.co.uk. Thank you. Can you point me to the Leeson history of this firm please? We have a note about a Great Uncle bringing twinsets each year to Great Aunts in Lincolnshire and our family history has led us to your amazing work. Thank you. Hi Sue – that’s very intriguing! There are documents relating to this part of the company’s history in the archives, so you could come down to the Design Archives to look through the materials! You can make an appointment by emailing designarchives@brighton.ac.uk – it would be great to see you!